When it comes to slaughtering animals too sick or weak to even stand for human food, the majority of U.S. citizens are resoundingly opposed. But despite this public sentiment, the U.S. Department of Agriculture (USDA) allows this irresponsible and inhumane practice to continue, resulting in immense suffering for several species of farm animals. Commonly referred to as "downers," these incapacitated animals can languish for hours or days without receiving veterinary care or having their basic needs met, and are often subjected to extreme cruelty, including being dragged, kicked, prodded, and beaten to get them to the kill floor. Ignoring the plight of these sick, injured and weak animals, the factory farming industry sees them as commodities and acts according to short sighted economic considerations without regard for their suffering or the human health risks associated with consuming their flesh. Since 1986, Farm Sanctuary has been waging our No Downers Campaign to bring an end to these appalling abuses, and we have made important progress -- including helping to pass the first state law to protect downed animals at stockyards and slaughterhouses in California in 1995 and inspiring others to follow suit. On a national level, after the discovery of mad cow disease in a downed cow in Washington state in 2003, the USDA approved a stop gap policy against slaughtering downed cattle for human food; however, it took the agency until 2009 to solidify and better enforce this policy and remove loopholes that were allowing downer cows to remain on consumers' plates. But even after enacting a clear "no downer" policy for cattle, the USDA still permits downed calves, pigs, sheep, and goats to be used for human food, and it's estimated that nearly 1 million farm animals, mainly pigs, are downed each year at U.S. slaughterhouses. Meat industry representatives have argued that using downed animals for food poses no risk to human health and assert that the practice should continue. In fact, that's exactly what they said in regard to downer cattle and, even after the discovery of mad cow disease and proof that downed cows are more likely to carry it, continued feeding meat from non-ambulatory animals to U.S. consumers, including children who received meals through the National School Lunch Program. Clearly, this is an industry that cannot be trusted. It stands to reason that meat from any farm animal who is too sick to stand poses an increased risk to consumers, but the USDA has typically taken a "don't look, don't find" approach, enabling agribusiness to act unscrupulously in order to bring in a few extra dollars. It's time for the USDA to stop protecting factory farmers and start doing right by consumers and suffering animals by extending its "no downer" policy to include species besides cattle too. In prior deliberations about downed cattle, the USDA was encouraged to address concerns surrounding the slaughter of other non-ambulatory animals, but had failed to do so. Recently, however, in response to a petition submitted by Farm Sanctuary requesting that the USDA extend the "no downer" regulations to pigs, sheep, goats, and other animals, the agency announced that it will accept public comment on the issue. 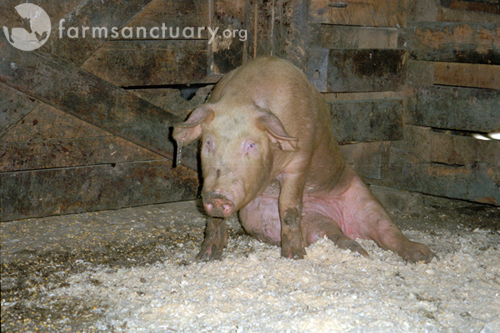 Now is our chance to let the USDA know that we reject these inhumane and unsafe practices and demand that action is taken to prevent downed animals from being abused and slaughtered for human food.